With two children whose innocence of Santa Claus is so lovely to watch, the perfect accompaniment to the run up to Christmas each year is Portable North Pole. With personalised messages, videos and phone calls, it really has it all to show your children that Santa really is watching them and knows who they are and what they get up to. For me the value of the pass is fantastic especially with two children as I have a range of videos to choose from which means they can always receive different words from Santa. That’s particularly important to me as I don’t want them to give up the dream of Santa dropping their presents down the chimney on Christmas Eve! They have both received their first video this year and it’s the smile on their faces as they eagerly watch it that gets me, then the questions they come out with: How does Santa know this?, How does Santa know that? I’ve been busy creating some other videos for each of them to watch over the next few weeks. What I like about them is that they are only a minute or two long, perfect for your child’s attention span, and with all the personalisation, names, relatives, where they live and even photos, it really does help to bring the magic alive! I’m particularly looking forward to the Christmas Eve video and also Santa’s storytime each week which I think my youngest will really appreciate. Portable North Pole really does make your kids Christmas really special and adds to the build up throughout December. I’d highly recommend it to add to the Christmas spirit in your household and keep everyone on their toes – Remember Santa knows if you are being naughty or nice! Christmas is the perfect time for family to get together and enjoy relaxing, although it’s always a bit hectic with young children around. Unfortunately I wasn’t able to get Christmas Eve off work this year so luckily my mum and dad offered to look after the children. They took them out for the day to a local garden centre to have lunch and meet Santa. 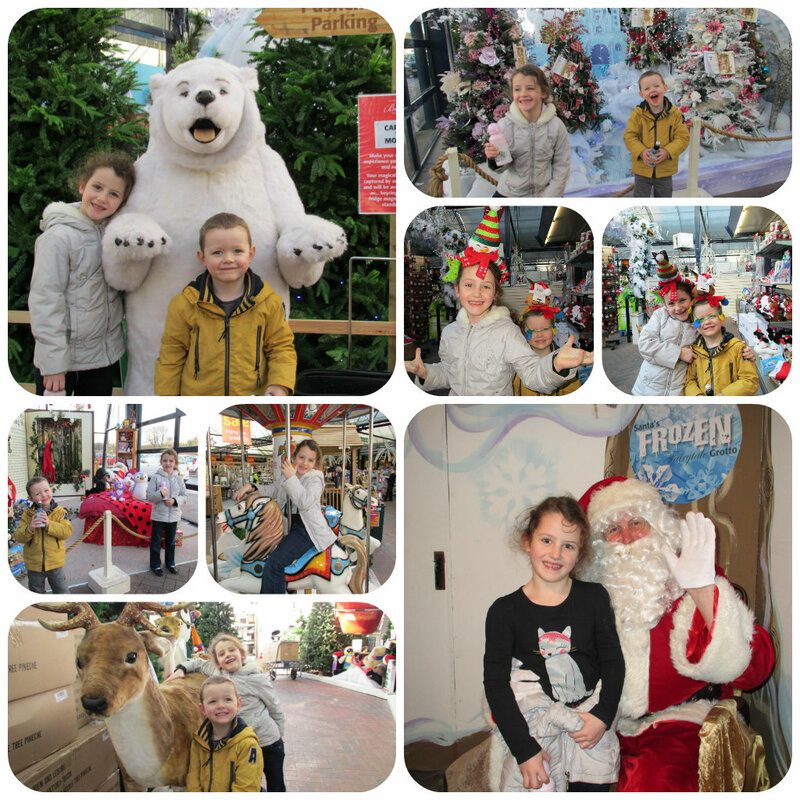 It was lovely seeing the photos when they got back as they looked so happy and had a wonderful day, leaving them full of excitement in anticipation of Santa’s visit that night. Later that evening I had the job of icing together a gingerbread house that Miss M had baked the previous day. I couldn’t let her down by not finishing it, but having not made one before, I didn’t realise how long I would need to stick bits together – definitely not something to be doing while you are busy and rushing, but after a few mishaps I managed to put something together. I see it as a learning curve for next years which I hope will look much improved! And so Christmas Day arrived, I was so busy playing with the children, helping chop the vegetables for dinner, drinking something bubbly, that I hardly took any photos, but I do have a few as memories of the day which I’ve shared below. 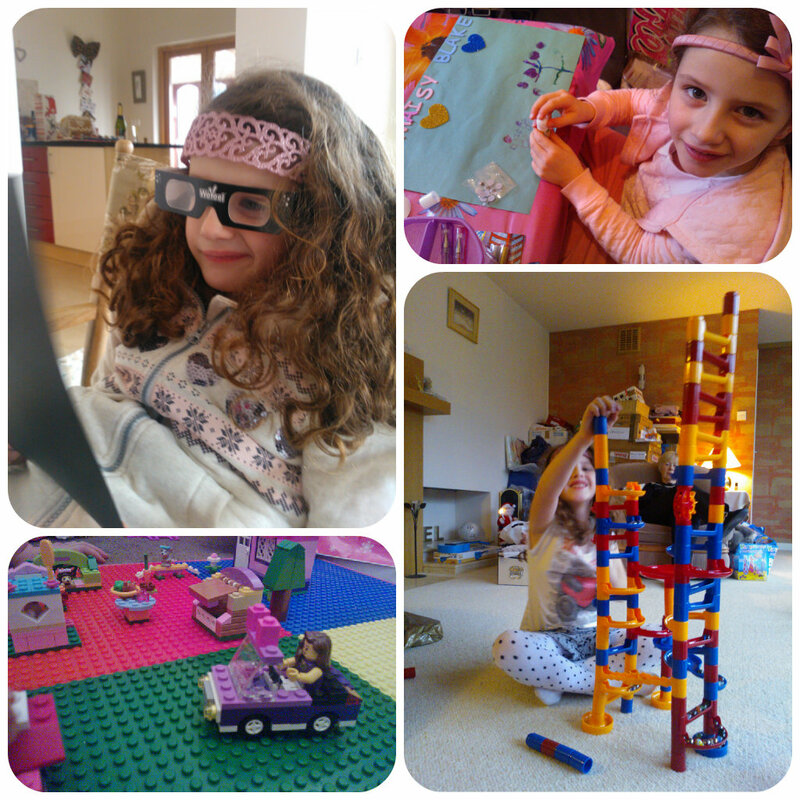 Miss M spent the day playing with her new Lego, as well as building huge marble runs, crafting with all her arts and crafts materials, making customised headbands with a headband kit, and making 3D pictures with a 3D kit she got. 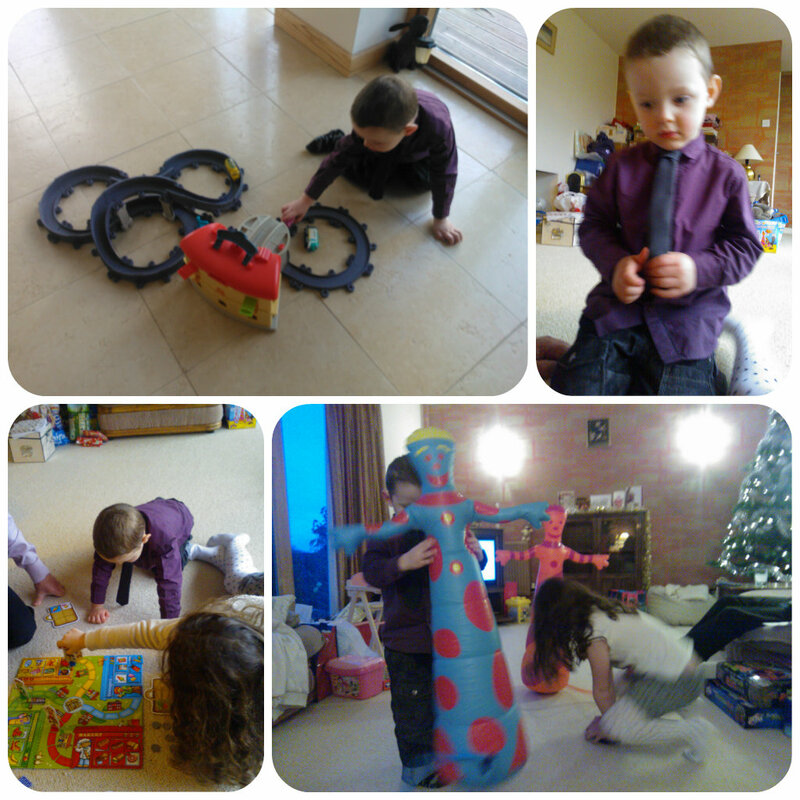 Mister B loved his Chuggington train set and spent much of the day playing trains, but did enjoy joining in with Orchard Toys Pop to the Shops game and both children had so much fun and giggles playing Pumpaloons! All in all we had a fabulous Christmas, everyone had fun, we had lots of laughs. We were all tired out and had a lazy Boxing Day but I did manage to pop to the shops yesterday for a quick spot of sale shopping. 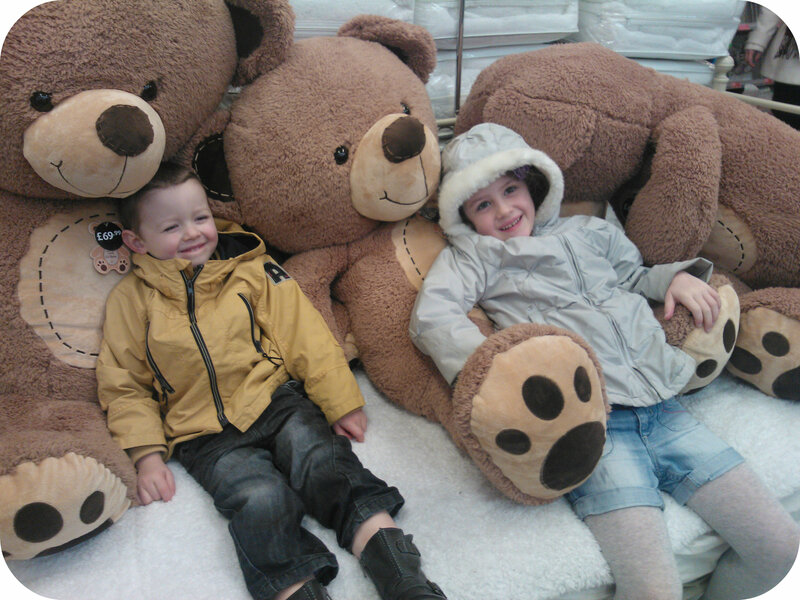 The children may have been too tired to walk round, but they spotted some huge teddies to curl up next to and relax while mummy picked up a few bargains!